James Sanford Anderson, Jr., age 76, of Niota, TN, passed away Friday, March 15, 2019, at Parkwest Medical Center in Knoxville, TN. A native and life-long resident of McMinn County he was a son of the late James Sandford, Sr. and Mary Ruth Smith Anderson. He was a member of Solid Rock Baptist Church, and was retired from CSX Railroad after 31 years of service. 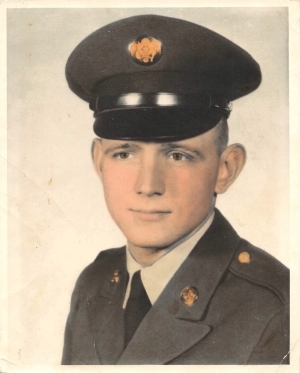 He was a Veteran of the U.S. Army having served in Vietnam. James loved his family and The Lord. 6 grandchildren, Josh Anderson, Kiersten Anderson, Jason Anderson, Morgan Anderson, Jacob Anderson and Alex Anderson. Funeral Services will be 7:00 PM Monday, March 18, 2019 in the chapel of Laycock-Hobbs Funeral Home with the Rev. Dennis Leamon and Rev. Kenny Waldrop officiating. Graveside services will be 11:00 AM Tuesday, March 19, 2019 at Cedar Grove Cemetery. Active pallbearers will be Josh Anderson, Jason Anderson, Jake Anderson, Evan Chastain, Caleb Lawson, and Sammy Pallent. Memorial contribution may be made to St. Jude's Children Hospital. The family will receive friends from 5-7 PM Monday prior to the service at the funeral home. Those unable to attend may send condolences to www.laycockhobbs.com/notices/James-Anderson. Laycock-Hobbs Funeral Home in Athens is in charge of the arrangements.